Can I just tell you how happy I am? I mean really, really happy. I saw the pattern for Savage Cocos Presto popover top a while back on Fadanistas blog and thought it looked great, then again on Shams blog and knew I had to buy it. I loved the simple shape, but it was different to most t-shirt style tops you see offered. 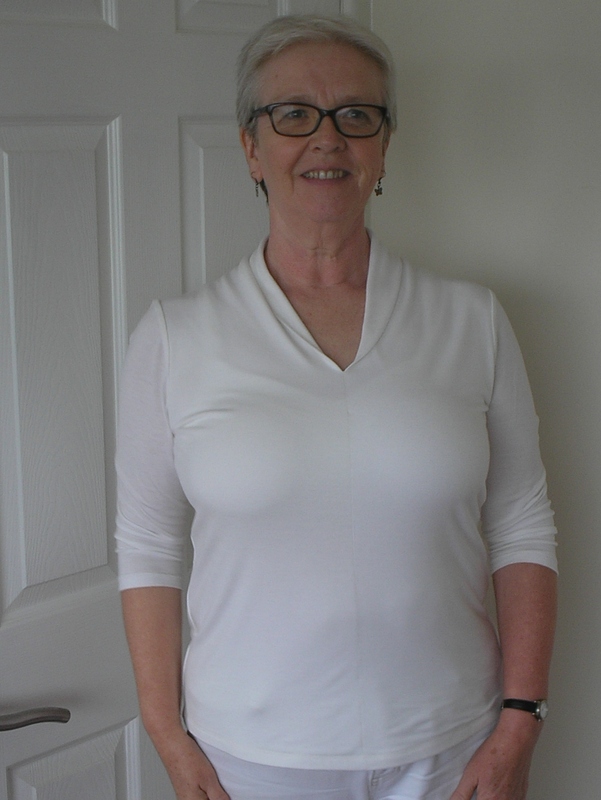 Shams is a similar shape to me (but with less tummy lumps) so I knew when she made it and was happy with a fit almost straight off the basic pattern I could be in luck. This pattern turned out to be my unicorn pattern. I made the large size directly from the pattern. No changes. Not a one. What do you think?! The fabric is a very fine viscose single knit jersey that I bought several weeks ago with the intention of turning it into my basic t. It is magnificently soft and was not expensive so I bought it in this cream, pale pink, and a soft peach. I knew I had previously bought t-shirts from GAP in a very similar fabric – and then remembered that they were relegated to bed wear as they felt too fine for general use. Doh! I downloaded the PDF over the weekend and taped and traced on Monday night. I cut the fabric out yesterday after I finished client work with the intention of making it today. It took about an hour. Yes, an hour – and that included threading all three machines in the correct thread. Zippy make. The fact that this t-shirt has a double front as part of the design meant that I had found a use for this lovely, but currently unloved fabric. I cut the back double too (though the pattern can be made up with a single back) but left the sleeves as a single layer. The collar/neckline can be left to ‘flop’ or if the fabric plays ball can be made to look like a shawl collar. The weather here in Bewdley has turned cold and wet today so the double layer t-shirt is fabulous as it just adds a little bit of extra warmth without actually conceding that autumn may be sneaking up on us (I did see that the trees are starting to change colour on Monday). I know I have some brown merino wool jersey that I bought and decided was too fine for the project I had intended it for in the stash. I think I have just found its purpose. I will do my best not to bore the pants off you all with this pattern but I honestly think I have struck gold. A pattern that needed no alterations. Whatever will they think of next!